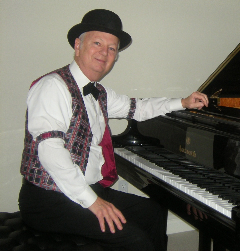 Originally from Bay City, Michigan, Dave immigrated to Canada in 1969 to teach music at the University of Calgary after earning a Masters Degree in Piano Performance. He spent 1971-72 teaching and studying at the Univ. of Colorado. Then in 1972 he returned to Calgary to teach privately and freelance as a musician. Library, Mt. Royal College, and the University of Calgary. In 1978 Dave joined the Calgary Board of Education as a primary school teacher. After retiring from the CBE in 2001, Dave has been pursuing his music career in earnest, performing for private events and in public concerts and shows. In July of 2010 Dave and his wife, Nancy, moved to Parksville, B.C. Since arriving at their new home in Craig Bay, they have been busy with musical performances, raising guide dogs for B.C. Guide Dogs, and outdoor activities.